While she is best known as a postcolonial theorist, Gayatri Spivak describes herself as a “para-disciplinary, ethical philosopher”– though her early career would have included “applied deconstruction.” Her reputation was first made for her translation and preface to Derrida’s Of Grammatology (1976) and she has since applied deconstructive strategies to various theoretical engagements and textual analyses including feminism, Marxism, literary criticism and postcolonialism. Despite her outsider status — or partly, perhaps, because of it — Spivak is widely cited in a range of disciplines. Her work is nearly evenly split between dense theoretical writing peppered with flashes of compelling insight, and published interviews in which she wrestles with many of the same issues in a more personable and immediate manner. What Edward Said calls a “contrapuntal” reading strategy is recommended as her ideas are continually evolving and resist, in true deconstructive fashion, a straight textual analysis. She has said that she prefers the teaching environment where ideas are continually in motion and development. Nonetheless, the glossary of key terms and motifs that is available below may serve as a kind of legend to a map of her work. It is not intended as a “bluffer’s guide to Spivakism” (The Spivak Reader) but rather blazes on a trail into this difficult and important body of work. Spivak’s usage of “responsibility” (like her dialogic understanding of “speaking,” noted above) is akin to Bakhtin’s “answerability” (otvetstvennost: sometimes also translated as “responsibility”). It signifies not only the act of response which completes the transaction of speaker and listener, but also the ethical stance of making discursive room for the Other to exist. In other words, “ethics are not just a problem of knowledge but a call to a relationship” (Introduction to The Spivak Reader). The ideal relationship is individual and intimate. This is what she means by “ethical singularity,” the engagement of the Other in non-essential, non-crisis terms. In the Boundary 2 interview, Spivak wistfully pronounces that, of the two things she is best known for, both are often misunderstood. The first was her answer to the question “Can the Subaltern Speak?” and the second is the notion of strategic essentialism. Essentialism is bad, not in its essence — which would be a tautology — but only in its application. The goal of essentialist critique is not the exposure of error, but the interrogation of the essentialist terms. Uncritical deployment is dangerous. Critique is simply reading the instructions for use. Essentialism is like dynamite, or a powerful drug: judiciously applied, it can be effective in dismantling unwanted structures or alleviating suffering; uncritically employed, however, it is destructive and addictive. Spivak’s strategy is deconstructivist, like that of a good lawyer: when on defense, prod the prosecution’s narrative until the cracks begin to appear and when prosecuting, piece together a case by understanding the criminal’s motivation. “Strategic essentialism” is like role-playing, briefly inhabiting the criminal mind in order to understand what makes it tick (See Postcolonial Performance and Installation Art). The Subaltern Studies group, for example, succeeds in unraveling official Indian history by particularizing its narrative: “a strategic use of positivist essentialism in a scrupulously visible political interest” (The Spivak Reader 214). This is also the way Spivak uses deconstruction, for example, without fully subscribing to it as a viable philosophic system or practice, much less a political program. Or, as she puts it, “[Deconstruction] is not the exposure of error. It is constantly and persistently looking into how truths are produced.” (Arteaga interview) “Although I make specific use of deconstruction, I’m not a Deconstructivist” (Post-Colonial Critic). The misuse of the concept of “strategic essentialism” is that less “scrupulous” practitioners ignore the element of strategy, and treat it as simply “a union ticket for essentialism. As to what is meant by strategy, no-one wondered about that.” She claims to have given up on the phrase, though not the concept (Danius and Jonsson interview). Spivak achieved a certain degree of misplaced notoriety for her 1985 article “Can the Subaltern Speak? : Speculations on Widow Sacrifice” (Wedge 7/8 [Winter/Spring 1985]: 120-130). In it, she describes the circumstances surrounding the suicide of a young Bengali woman that indicates a failed attempt at self-representation. 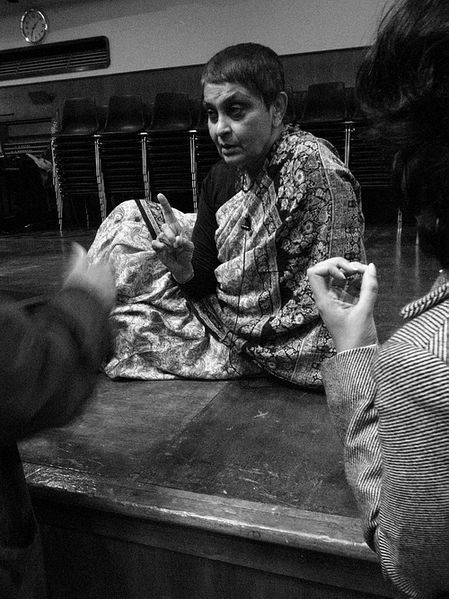 Because her attempt at “speaking” outside normal patriarchal channels was not understood or supported, Spivak concluded that “the subaltern cannot speak.” Her extremely nuanced argument, admittedly confounded by her sometimes opaque style, led some incautious readers to accuse her of phallocentric complicity, of not recognizing or even not letting the subaltern speak. Some critics, missing the point, buttressed their arguments with anecdotal evidence of messages cried out by burning widows. Her point was not that the subaltern does not cry out in various ways, but that speaking is “a transaction between speaker and listener” (Landry and MacLean interview). Subaltern talk, in other words, does not achieve the dialogic level of utterance. Beyond this specific misunderstanding (proof perhaps that Gayatri Spivak cannot speak?) Spivak also objects to the sloppy use of the term and its appropriation by other marginalized, but not specifically “subaltern” groups. “Subaltern,” Spivak insists, is not “just a classy word for oppressed, for Other, for somebody who’s not getting a piece of the pie.” She points out that in Gramsci‘s original covert usage (being obliged to encrypt his writing to get it past prison censors), it signified “proletarian,” whose voice could not be heard, being structurally written out of the capitalist bourgeois narrative. In postcolonial terms, “everything that has limited or no access to the cultural imperialism is subaltern — a space of difference. Now who would say that’s just the oppressed? The working class is oppressed. It’s not subaltern” (de Kock interview). Another misreading of the concept is that, since the subaltern cannot speak, she needs an advocate to speak for her, affirmative action or special regulatory protection. Spivak objects, “Who the hell wants to protect subalternity? Only extremely reactionary, dubious anthropologistic museumizers. No activist wants to keep the subaltern in the space of difference … You don’t give the subaltern voice. You work for the bloody subaltern, you work against subalternity” (ibid) (See Museums and Colonial Exhibitions, Myths of the Native). She cites the work of the Subaltern Studies group as an example of how this critical work can be practiced, not to give the subaltern voice, but to clear the space to allow it to speak. Spivak is particularly leery of the misappropriation of the term by those who simply want to claim disenfranchisement within the system of hegemonic discourse, i.e. those who can speak, but feel they are not being given their turn. “Many people want to claim subalternity. They are the least interesting and the most dangerous. I mean, just by being a discriminated-against minority on the university campus, they don’t need the word ‘subaltern’ … They should see what the mechanics of the discrimination are. They’re within the hegemonic discourse wanting a piece of the pie and not being allowed, so let them speak, use the hegemonic discourse. They should not call themselves subaltern” (ibid). Privilege is also a kind of insularity which cuts off the privileged from certain kinds of “other” knowledge. One should strive to recognize these limitations and overcome them, not as a magnanimous gesture of inclusion, but simply for the increase of knowledge. The way to do this is by working critically through one’s beliefs, prejudices and assumptions and understanding how they arose and became naturalized. Any Zen master, chiropractor, or guitar teacher will tell you that real learning can only begin once years of mental habit, bad posture, and learning riffs the wrong way are undone, or unlearned. What we are asking is that the holders of the hegemonic discourse should de-hegemonize their position and themselves learn how to occupy the subject position of the other rather than simply say, “OK, sorry, we are just very good white people, therefore we do not speak for the blacks” (Intervention interview). Spivak, Gayatri Chakravorty. Translation of and introduction to Derrida’s Of Grammatology. Baltimore: John’s Hopkins, 1976. An Aesthetic Education in the Era of Globalization. Harvard University Press, 2012. A Critique of Post-Colonial Reason: Toward a History of the Vanishing Present. Cambridge: Harvard UP, 1999. “Can the Subaltern Speak?” in Cary Nelson and Larry Grossberg, eds. Marxism and the interpretation of Culture. Chicago: University of Illinois Press, 1988: 271-313. Death of a Discipline. New York, Columbia University Press, 2003. “Displacement and the Discourse of Woman” in Mark Krupnik, ed. Displacement: Derrida and After. Bloomington: Indiana UP, 1983: 169-95. In Other Worlds: Essays in Cultural Politics.London: Methuen, 1987. Outside In the Teaching Machine. London: Routledge, 1993. Selected Subaltern Studies. Ed. with Ranajit Guha. Oxford: Oxford UP, 1988. The Spivak Reader. Ed. Donna Landry and Gerald MacLean. New York and London: Routledge, 1996. This book includes an extensive list of publications, including many interviews. The Post-Colonial Critic: Interviews, Strategies, Dialogues. Ed. Sarah Harasym. London: Routledge, 1990. Alfred Arteaga. “Bonding in Difference.” The Spivak Reader. New York and London: Routledge, 1996. Landry and MacLean. “Subaltern Talk.” The Spivak Reader. New York and London: Routledge, 1996. I have been supervising an A.M. thesis, on Spivak’s “Can the Subaltern Speak?” for three years. As much as I enjoyed the philosophical notions of Spivak’ s “Can the Subaltern Speak?”, I suffer a lot with my student whose Arabic translation of this essay was the most difficult challenge I ever encountered. Having finished my editorial work of the Arabic translation of this dense philosophical work, I wonder how this very long work is classified as an essay. Its wide and profound arguments are worth to be published as a book. I wonder if Spivak, or any publishers thought of having this essay published as a book, if so when was that , and who was the publisher? Please answer my question urgently because I do need to buy this book. Thanks a lot Caroline for replying. I have got this book online. It is very useful. I wonder if Spivak’s essay “Can the Subaltern Speak” was translated, or not. If so, to what languages? I am glad the book helped. I am not sure what languages Spivak’s essay has been translated into. However, I would not be surprised if it had been translated into multiple languages given the essay’s influence. In English, Stephen Morton’s book is a big help in reading Spivak. Spivak’s “Can the Subaltern Speak” appears in an altered, and slightly extended form, in her book The Critique of Postcolonial Reason (1999), which expands in great detail upon a number of the basic philosophical precepts of her argument in the original article. Hello, sir I’m translating the Routledge critical thinker of spivak into urdu language in order to introduce the spivak’s ideas in the urdu discourse. Can you please help me to get any official link of ma’am spivak. Hi, Muhammad. I believe the best way to contact Professor Spivak is from her contact information on her faculty page at Columbia University. Could you please present your views about my work? Hi, Muhammad. I think it sounds like a great idea. Good luck! Sir I have sent e mail to gcspiv@gmail about my urdu translations of gayatri spivak 22 days ago. But I could not receive nay reply from spivak’s side. Could you help me to get approach to ma’am spivak. I need her appriciation upon this work for my motivations and interests.